Retiring after 20 yrs make offer. Choose any combintion of females that value 4000 or more and we will include 1/2 interest of Surprise free. Undate Surprise's 1/2 brother AOV Accoyo Eros is the second highest selling lot at Breder's Edge. Accoyo America Centurion stormed the show ring by winning the 2005 AOBA Nationals as a fawn color champion as a yearling. On the way he produced one of the finest medium fawn full accoyo male to hit the show ring ( Accoyo American Enterprise)who is currently priced at 30000 for 1/2 int. Enterprise has stamped his approval on this future herdsire. Already he has 2nd place at the Va Classic in 2011, 2012 and 3rd at Va Classic 2013 behind MFI and Double O Good. First and Color Champion at Ky Classic. Judges comments he is the total package. US Enterprise's Surprise is so close to being a carbon copy of his sire and grandsire. We are offering a introductory stud fee of only500 to this upcoming star. So book your breedings now or roll the dice and take a chance on Surprise being as good as his sire and purchase 1/2 int for 3000. This little gal is a combo of Accoyo Titan and PPPeruvian King genetics. ?My Peruvian Powder Keg is her sire with 4 Peruvian Pachacuti 6011 on the dam's sire side. Powder is out of the famous Accoyo Titan who sold for $250K in 2007! ?All these genetics are evidenced in this lovely female. Nice compact frame with a dense fleece to make you smile. Sweet personality to match! Amora has given us 2 outstanding offspring .. both out of Accoyo America Alpha. 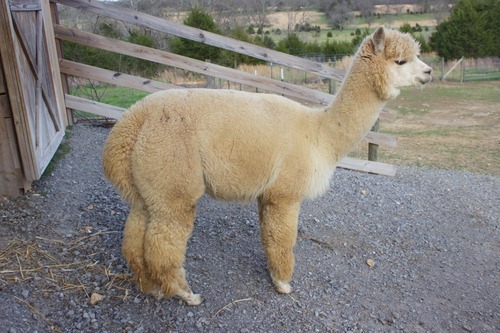 Daughter, Airlie took a well deserved 3rd Place at the 2013 Carolina Alpaca Celebration. This class was full and extremely competitive! No skin line and lots of bright luster and well defined crimp. Show judge loved her. Nice feminine conformation.